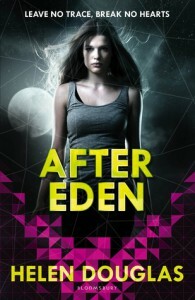 After Eden is a quick, easy read with a believable and interesting sci-fi premise. Unfortunately, that's about all this book has going for it. It started off rather slowly, possibly due to the fact that I didn't really have any connection with the characters. Eden was a fairly bland character; she had little personality to begin with and once Ryan was introduced, she quickly fell straight into a puddle of instalove. She was jealous, insecure, and really oblivious, so reading her narration could be slightly painful at times. Ryan, the new boy at school, was just... there. Sure, he was mysterious and the mission that he was on was kind of interesting, but he didn't have much of a personality. And Connor, the best friend, drove me crazy. He spent most of the book pining over Eden, who never noticed that he was interested despite being told many times by Ryan. This would have been acceptable behaviour if he didn't spend the entire book arguing with Eden merely because he was jealous; for two people who claim to be best friends, it was often hard to tell that they even liked one another. Once Eden discovered Connor's yet-unwritten autobiography, the plot began moving at a much quicker pace. I really liked the sci-fi aspects of the story: the constellations and time travel were explained quite well and the reasons why Ryan came back were interesting. Overall, After Eden was a disappointing read. The concept behind the story was interesting, but unlikeable characters and too much instalove made it difficult to enjoy. This review can also be found at The In-Between Place. I received an advanced copy of this book from Netgalley in exchange for an honest review.